The most popular key case contains SABRE Red’s Maximum Strength formula offering immediate access to your pepper spray when keys are in a lock or car ignition via the Quick Release Key Ring. Providing protection at a safe distance, the powerful stream deploys approximately 25 bursts (approx. 5x’s more than other brands) at a range of up to 10 feet. Boasting a 4-year shelf life that’s double the industry average, SABRE RED is a much a better value. This compact canister delivers approximately 25 shots with a range of 10 feet. RECOMMENDED: ADD A PRACTICE SPRAY TO YOUR ORDER AND SAVE! Why should I practice with a SABRE Practice Spray? 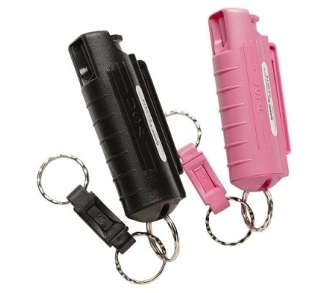 You'll become familiar with retrieving your pepper spray, grasping it properly, unlocking the spray, and deploying. The first time you deploy your spray SHOULD NOT be in a potentially stressful situation. When you become proficient with the practice spray, you'll be more prepared to use pepper spray in a real life emergency. Through target practice, you'll become familiar with the spray pattern and deployment range, and your accuracy will improve. Practice deploying the spray with one hand in order to leave one hand free. A great way to become familiar without using pepper spray. Available as a Hard Case, ½ oz Canister, and as a replacement cartridge for your SABRE Red Spitfire. A low cost way to maximize your safety. As all of the steps come together, you'll be more confident in your own abilities.